All young people are welcome. Some activities and events will be split into age groups, ie 13 - 17 and 18+. Young people participate fully in a monthly youth Mass, planning the music, reading, offertory and occasionally giving testimonies of activities they are involved in, for example, caring for the homeless in our community. We have a youth Mass every month, usually the last Sunday at 5 o’clock mass. 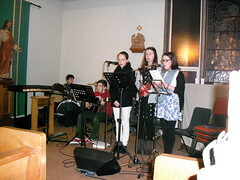 There are music practises prior to each Mass. A youth drama group also meets once a month. Check out the events for next year. © 2012 Our Lady of Lourdes Parish Dunfermline (A parish of the Archdiocese of St. Andrews & Edinburgh, a Charity registered in Scotland. Charity No. SC008540.) All rights reserved.